When choosing a Tucson hotel, there is no better choice than the Hilton Tucson East. Located in the heart of Tucson, Arizona, the Hilton Tucson East hotel offers unforgettable views of the Santa Catalina Mountains and Saguaro National Park. This upscale Tucson hotel is also convenient to downtown Tucson, Tucson International Airport, and the Tucson Convention Center. 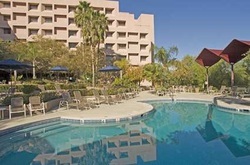 The Hilton Tucson East is a perfect Tucson vacation hotel for exploring the desert southwest. 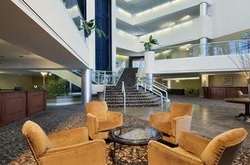 Business travelers find the best of Tucson corporate hotel amenities available. Book our executive level rooms for the ultimate stay, book a meeting or event online or choose a special or package for your Tucson vacation getaway. The hotel has just finished a multimillion dollar renovation and the hotel's seven-story atrium lobby window shows off Sabino Canyon's best views on every level. The hotel features 232 guest rooms that offer guests superior comfort and convenience. 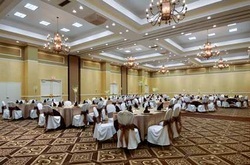 The following are prices options available at the Hilton Tucson East which includes a professional DJ, Photographer, Class Website, Facebook Reunion Community Page, Classmate Name Badges, Door Prizes*, On-Site Reunion Coordinator, and much more. Hot & Cold hors d'oeuvres cocktail reception option - Choices include Ahi Tuna, Lobster Medallions with Lemon-Basil Aioli & Chicken or Beef Satays with Spicy Peanut Sauce. Plated Dinner (Most Popular) - Dinner options include Beef, Chicken, Pork or Vegan option. All meals include salad, rolls, vegetables, coffee and dessert.